Storage devices are used to store data and instructions permanently. Storage devices are also called secondary storage devices / backing storage devices / external storage devices or auxiliary storage devices. Examples of storage devices include Hard Disk, CD and DVD etc. Primary memory(RAM) is volatile and temporary. When computer is switched off, all data in ram is erased. Storage devices can store large amounts of data and instructions permanently whereas Primary memory has less capacity of storing data. Magnetic tape is the oldest storage device. It is made of plastic coated with magnetic material. Data is stored on magnetic tape in the form of magnetic spots. Tape drive is used to read and write data on tape. Magnetic disk is sequential access device. It is slower device than magnetic disk or optical disk. Magnetic tapes are used in reels of different lengths, for example 200, 600, 1200 feet etc. The hard disk is also called fixed disk. It consists of one or more metal plates. The plates are fixed in the drive. Metal plates are coated with magnetic material to store data. A motor rotates disks. There is also an access arm and read / write heads to read and write data on disks. - The storage capacity of hard disk is much greater than floppy disk. - Now a days hard disks of size 40 GB, 80 GB or more are available. - Hard disk is covered in a hard jacket and there are less chances of disk damage due to dust and mishandling. - Now days Operating system and application programs are installed on hard disk. 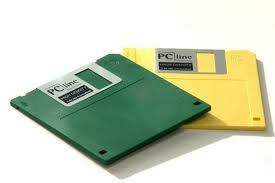 - Before using a magnetic disk we use operating system to format the disk. Operating system divides the disk into circles called tracks. Each track is divided into pie-shaped areas called sectors. Data is stored in sectors. Each sector can store 512 bytes. Floppy disk is a small plastic plate coated with magnetic material. Data is stored in magnetic spots. Main advantage of floppy disk is that it is used to transfer data from one computer to another. Floppy disk drive is used to read and write data on floppy disk. It is also called micro floppy disk. Its diameter is 3½ inch. It is covered in a hard plastic cover. Read/Write window is covered with a metal shutter. When disk is inserted into disk drive then shutter is automatically opened. It can be write protected by a notch. Storage capacity of micro floppy is 1.44 MB. · 5¼ Inch floppy disk. It is a 5¼ inch diameter plastic plate coated with magnetic material. Its storage capacity is 1.2 MB. It is not used in modern computers. 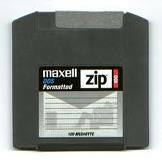 Zip disk is similar to 3 ½ inch floppy disk. But it can store 100 MB or more data. Zip disk drive is used to read and write data on a zip disk. LASER technology is used to read and write data on Optical disk. LASER stands for Light Amplification through Emission of Radiation. Laser beam writes on the surface of optical disk by creating very small holes. The presence of hole represents a One and absence of the hole represents a Zero. There are following main types of optical disk. CD-ROM stands for Compact Disk-Read Only Memory. The data stored on Cd-Rom can only be read. It cannot be deleted or changed. It is a portable storage device. Data can be easily transferred by CD Rom from one computer to another. Commonly it can store 650 MB / 700 MB/ 750 MB data. 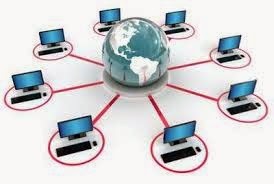 It is used to store large amounts of data like Software or audio/video data.We purchase Software, movies, dramas, lectures, books, wallpapers and other data on Cd-Rom. There are many Advantages of Compact Disk. 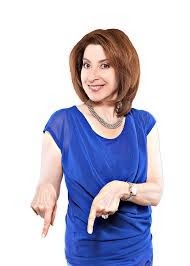 CD-R stands for Compact Disk -Recordable. Initially, it is a blank disk. User can store data on it only once. This is why it is also called WORM(Write Once Read Many) disk too. Because we can write data on it only once and later we can read many times. The devices to store data on CD-R are called CD Writers or CD Burners. We can write data on CD-R only once, but can read data many times. Because of this write once read many quality, CD-R is often known as WORM(write once read many). 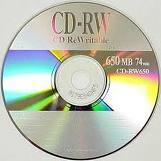 CD-RW stands for Compact Disk Rewritable. This is a special type of CD. User can write data on it, if there is an error in writing data, he may erase the contents and rewrite again. 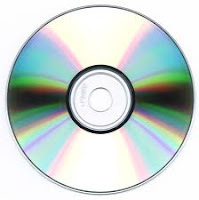 CD-Writers are used to store data on CD-RW. DVD stands for Digital Video Disk. A laser beam with a short wave length is used to create very very small holes on the surface of disk. So there are much more tiny holes on the surface of DVD as compared to that of CD. Therefore, storage capacity of DVD is much larger than CD. It can store up to 17 GB or more data. DVD-ROM is pre recorded and it can contain data like movies, videos and software etc. User cannot change or delete data from DVD-ROM. It is read only. There are several Benefits of using Digital Video Disk or DVD. DVD-R stands for Digital Video Disk Recordable. Initially it is a blank disk. User can store data on disk only once. Then it becomes read only. It is normally used to store high definition video movies. 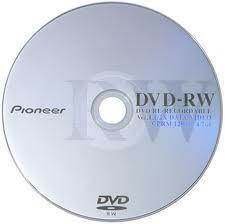 DVD-Writers are used to store data on DVD-R.
DVD-RW stands for Digital Video Disk Rewritable. User can write data on disk many times by erasing the old data. Here are some Differences Between CD and DVD. 464 shares since its post, Great! What are the differences between primary and secondary storage devices?